It is not immigration. 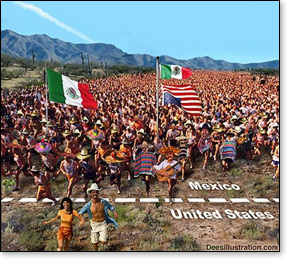 As fine as most of our Mexican brothers and sisters are, it is "invasion" to enter a country without permission. It is not immigration, and it has to stop. America must remain free and independent. We cannot survive being overrun by people who do not wish to assimilate, and who do not appreciate the unique treasure of our Constitution or our heritage of freedom. Yes, we had slavery, but millions of people fought and so many died to end it. Yes, we had discrimination and abuses, but millions of people who believed in the promise of the real America marched, wrote letters, sent telegrams, and voted, and some died to end that bad chapter. Yes, some of this still exists today in America, as it does everywhere, but no other nation in history tells people, "You are born free with unalienable rights from God." No man may take that freedom from you. You have a right and a duty to defend those freedoms. Allowing the growing influx of immigrants who don't understand the heritage of America — or the countless sacrifices that have made it possible — will lead to the loss of that heritage, and of the promise that is America. Americans are not against any people. We are made up of all nations. What we are so concerned with is people coming in not learning the language or the history and making no pledge of loyalty to our blessed Constitution — inspired by God, a great gift to the world, a document that has allowed for the greatest prosperity and overall success of any nation ever. Letting too many people come in illegally will lead to the neglect, disrespect, and loss of the protection and power of that great Constitution of the United States. There is no other nation like us, and if anyone has arguments to the contrary, it makes us wonder why they are here. In 1917, my grandparents came through lawful immigration channels, and had to learn some English, our nation's official language, so they could understand and appreciate our culture. Here we are all Americans — not Irish, not Polish, not Italians, not Jews, not Mexicans, not Africans, though they are all here. We are all Americans first. We all speak English as our primary language. We do not wave foreign flags. None of us want to take over our nation for "The Race." We Americans appreciate each other. We work together, we help and rescue each other, we defend each other, we wish each other well, we share the World Series and the Super Bowl, and we love George Washington, Abraham Lincoln, Martin Luther King, Santa Clause, and Superman. We fight with each other, then embrace each other, laugh and poke fun at each other's peculiarities, and even give our lives for each other. We don't mind if immigrants want to join us and become loyal freedom-loving Americans — but we fiercely mind if they want to overrun us and turn our one-of-a-kind gem of a nation into something else, or into the place they fled where there was no free opportunity, no free expression, no freedom to assemble, and no freedom to keep their government in check as "We The People" possess here in America. Stand back and observe the awesome power of a free people as they take back their government in the near future. We will not have to shoot and rampage. We have free political channels to get it done, unless those channels are shut down illegally by any leader wishing to put himself above the law or the will of this people — in which case, stand way back . . . .
Look at it this way, Mr. Illegal Immigrant. What if my eighteen friends and I decide to live in your house, as you discover when you return from work one day soon? We will help out some, but we will need your insurance card, and will be drawing regular "help" from your bank account. As soon as we get the chance, we'll be bringing in our brothers, sisters, uncles, and — sorry — you wouldn't want us to leave out our grandparents, would you? I know it will be difficult, but you can always move out, and so long as we can keep drawing from your account, we can all handle the rent, and oh, my brother says he can handle your job OK. The boss likes him at $5.00/hr. less. So, thanks, we'll be moving in soon! If the tables were turned on you like this, Mr. Illegal Immigrant, you wouldn't like it any more than we do. Your basic premise, which is that this is an "immigration" problem, is erroneous. "Immigration" is when people are "allowed" and welcomed to enter the United States. When people come across our borders without permission — literally breaking in — it is called an "invasion." Now the impulsive reaction may be to say, "Racist." No, not at all. We care not who the invaders are or where they are from. We only care that they threaten to overrun our society and harm its stability. We know that many of the Mexican people who come here are very good people. They go to church. They are family people and add to our society. 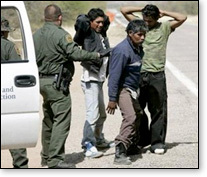 But we also have a big problem of our prisons being too filled with invaders, and all of our resources strained. And yet they keep coming. Not good. Also, there have been many Middle-Eastern marauders caught coming in. How many were not caught?
. . . And, Mr. 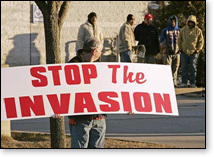 Illegal Immigrant, are you for amnesty — which would likely open the door even wider to unchecked immigration? If you are for that, then you wish to take over our nation completely, because that is what it would mean with many more millions coming in, with the borders STILL NOT SEALED! So, I ask you, who has the wrong perspective? I say: #1 — Seal the borders! #2 — Remove all serious offenders from our prisons and parole rolls and deport those criminals back to their country of origin, with a warning that to return would be an act of aggression against the U.S. From that point on, any illegal immigrant who commits a serious crime should be immediately deported upon conviction. That would be a good start. No more illegal immigrants allowed to invade. And no amnesty — and absolutely, under no circumstances, no permission to routinely bring in family members or others. Such a policy is not racist. It is fundamental to the survival of a free and independent America. President Obama: "No Amnesty for Illegal Aliens!"